Home / Blog / News & Articles / Camino Guided Tours 2014: are you ready? Camino Guided Tours 2014: are you ready? 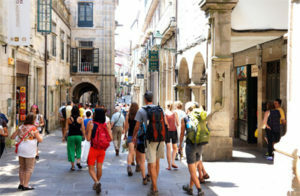 CaminoWays.com, the Camino de Santiago walking and cycling holiday specialist, is kick starting its popular guided tours on the Camino de Santiago this month. These week-long Camino guided tours are perfect for walkers looking to meet new people and share the Camino experience as part of a group, led by an experienced local guide. Walking the Camino truly is an experience of a lifetime and a guided tour will ensure that you make the very most of your trip. The CaminoWays.com English-speaking guides will walk with the group, sharing their knowledge of the local history, as well as providing practical advice and insider tips. The first CaminoWays.com guided tours depart in late March and will continue monthly until November, with many departures scheduled for the Spring and Summer months. This is the Camino’s most popular route which starts in the beautiful town of Sarria. This route is perfect for those looking to capture the essence of the Camino. Considered to be one of the most beautiful of all the “Last 100km”, this route starts in the city of Ourense famous for its thermal springs before taking walkers through the beautiful green and hilly landscapes of Galica. Beginning in the border town of Tui which is separated from Portugal by the River Minho, this trail passes through wood areas, farmlands and historic towns and cities. This route also takes walkers through the Rías Baixas, a region famous for its white wines and seafood. The Finnisterre Way is the only route on the Camino that begins in Santiago. The path then passes through quiet villages and unspoiled landscapes before reaching the stunning sea cliffs of Cape Finisterre. CaminoWays.com also organise guided tours on the Camino to Rome, the Via Francigena. This trail follows a path through quaint villages, charming towns and scenic countryside before finally finishing in the incredible ancient city of Rome. Prices includes: 8 day tour, accommodation (half board basis), airport transfers, luggage transfers from hotel to hotel and a holiday pack. Prices do not include: Travel insurance or flights. Start planning your Camino trip today by logging onto www.caminoways.com or calling 353 (0)1-525-28-86 353 (0)1-525-28-86.